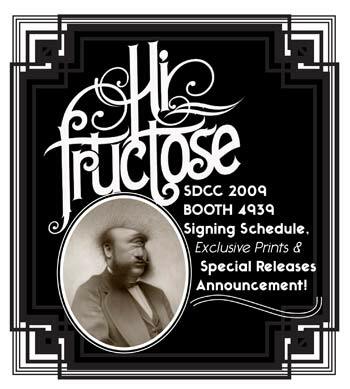 Hi-Fructose will bring an Oasis of Chaos to the San Diego Comic Con at Booth # 4939. Hi-Fructose will have an extensive list of artist signings, exclusive print releases and special items premiering at the event. Come meet Nathan Spoor, Lola, Camilla d’Errico, Chris Ryniak, Attaboy, Travis Louie, Brian McCarty, Edwin Ushiro, Luke Chueh, Scott Musgrove, and Brandi Milne and surprise guests. Score limited edition prints from many of the artists and find Mark Ryden’s YHWH, Hi-Fructose vol.12, Attaboy’s Talking Gooberry, Travis Louie’s “Curiosities” SDCC exclusive book, rare back issues and much more. We will be announcing surprise signings, updates, and announcements thru Twitter during the event. Follow us on Twitter..